Earlier today at MWC 2016 in Barcelona, Telegram announced that its encrypted mobile messaging app has passed 100 million monthly active users (MAUs). Back in March 2014, Telegram announced that it is now home to more than 35 monthly active users, which means that the app has nearly tripled its user base in a couple of years. According to Telegram founder and CEO Pavel Durov, users across 200 countries turn to Telegram to send more than 15 billion messages every day. 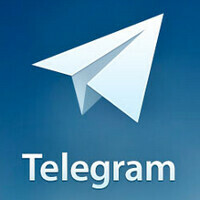 Furthermore, Durov announced that the instant messaging service is adding 350,000 new users per day. Notable as Telegram's growth may be, the IM service is nowhere near the popularity of its Facebook-owned rivals. WhatsApp, the world's most popular IM service, recently announced that it passed the 1 billion MAU milestone while Facebook Messenger is currently boasting north of 800 million MAUs. Nevertheless, for an IM service which remains independent, 100 million MAUs is still an impressive user base. The main reason why Telegram is the go-to app for more than 100 million users each month is the security-minded approach that the app brings to IM market. To many, the best feature about Telegram is called 'Secret Chats' and allows chat participants to delete messages or schedule self-destruct timers. Furthermore, communications are encrypted end-to-end, and the Telegram servers use the ultra-secure MTProto protocol. A couple of weeks ago, a major update brought several new features to Telegram, such as enhanced privacy controls, hotkey support, a new photo editor, sharing extensions, as well as a gyroscope-based feature that allows you to drop or record voice messages by lifting your phone. When will we see the article about that new find where more than 70% of device failures come from Android, with Samsung leading that statistic? No thanks Samsung. Im aiming as straight as an arrow for the G5 now. You could just get a Nexus or iPhone or HTC cause sense is the best UI for android if you ask me anyway. Sense is plain and featureless. Touchwiz is fully loaded with features. Since is smooth and works flawlessly that's what I like a about, same reason I like ios. Sacrifice features for smoothness. Apex and Nova launchers are super fast. Not smooth but insanely fast. I always end up not using most of the features in a feature packed phone. It's not that I forget about them or don't find them useful its just that I never need most of them. Sacrificing features for smoothness, doesn't bother me at all. I have never heard of Telegram before now, and I see no purpose of it. Instant messaging is lame and its better to use text messaging, KIK, or facebook messenger. I've never used Telegram. Will be trying this. Telegram is awesome. I've been using for about 6 months now. The main purpose I use it for are group chats. Group chats on regular text messaging apps is a dreadful experience. It has to be instant or else it can get confusing. Also another purpose for this app and the main reason why it exist is the option for secure private instant messaging. Pretty much snapchat instant message. Something standalone SMS cant offer....BTW FB messenger is IM..
SMS on my Lumia 950 or 1020 is flawless and works very well, not confusing even in groups of 10 or more. Facebook will buy it sooner or later. I've been using telegram for 2 years now and it's fantastic. Safe and secure you should all give it a try. It's Funny that a few months ago Facebook removed telegram fan page for no reason. Telegram is the best IM app available right now. I have been using it for more than an year now and i also have helped move all my clients onto that platform. I now manage communication with more than 15 centers on Telegram. Whatsapp doesn't hold a candle to Telegram. The most important features of Telegram are multiple installations on various platforms and the ability to send and receive any kind of document. I can install Telegram on my laptop too and can use it simultaneously whether my mobile is turned on or not. Also all my msgs are saved in the cloud so I can access my data from any part of the world. Whatsapp allows you to send only media and that too severly size restricted. Telegram can transfer any file, Office docs, zip files, pdfs and what not.